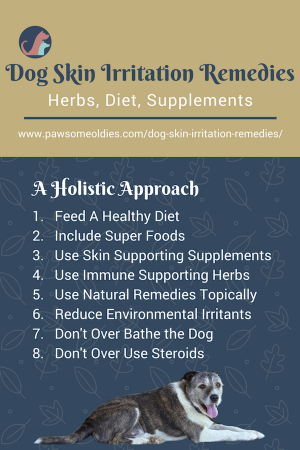 Use dog skin irritation remedies to holistically support skin health, soothe skin irritations, and boost the immune system. By addressing both the “inside” and “outside” health aspects of the dog, you stand a better chance of bringing the dog’s skin health back into balance. The skin is the largest organ of the body. It is no wonder that dog skin irritation is a common health issue in our canine friends. The skin comes into contact with all sorts of substances every day – some of which are irritants and even toxins. That’s why the skin is always the first organ to have problems and the last to heal. Older dogs are even more prone to skin irritations. Many older dogs have weaker immune systems, making it easier for the skin to get irritated and infected. Older dogs also tend to have more sensitive skin. In addition, some hormonal disorders common in older dogs (e.g. hypothyroidism, Cushing’s disease) cause skin problems as well. 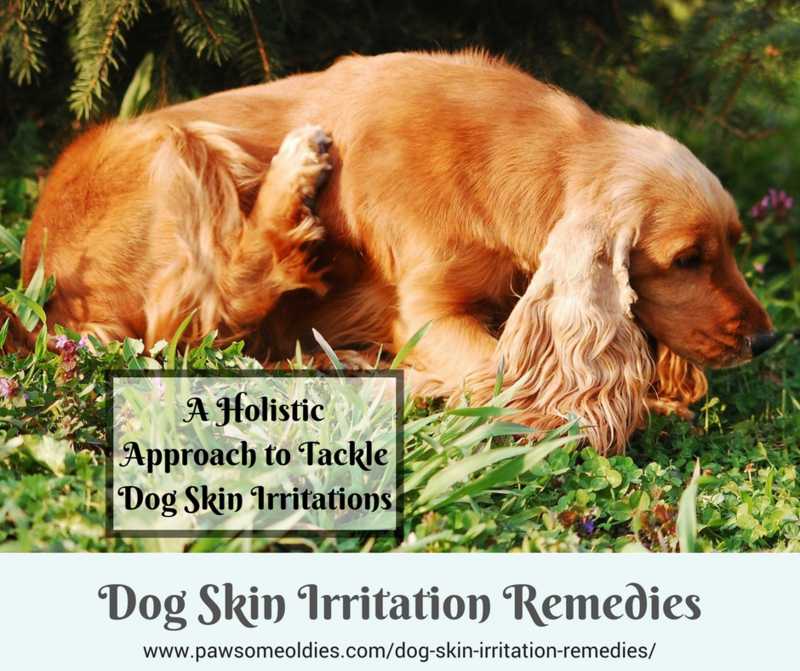 This post looks at some common skin problems that occur in old dogs, and how to use natural dog skin irritation remedies as a holistic approach to address dog skin issues. Does your old dog have dry skin and dandruff? Oldies unfortunately tend to have dry skin. One reason is that there are lower amounts of vitamin C in the cells of older dogs. Vitamin C is vital in producing and maintaining healthy skin. If an old dog doesn’t have a sufficient supply of vitamin C in the cells, cell aging may proceed more quickly. Some skin and hormonal disorders can also cause dry skin (see below). Canine atopic dermatitis (atopy) is estimated to affect about 10 percent of dogs. One symptom of atopy is intense itching. It’s easy to imagine a dog having atopy scratching, biting, chewing and licking at the itch all the time. As a result, skin irritations and infections often occur. Because other forms of less frequently-occuring allergies (e.g. food allergies and flea allergies) share a common symptom (itching), it is important to get a proper diagnosis. Older dogs are more prone to some hormonal disorders, such as hypothyroidism and Cushing’s disease. These hormonal disorders can cause skin problems as well. Dogs with Cushing’s disease also tend to suffer from hair thinning or loss, skin thickening and discoloration. This is a condition in which a dog incessantly and excessively licks the skin, usually at the junction of the leg and the foot. This excessive licking results in lesions with hair loss. The lesions can become red, irritated and infected. One cause of this condition is psychological. It can of course occur in all dogs, but may be more prone to older dogs for several reasons. Some oldies may have more stress due to aches and pains, hearing loss, etc. Or, they are just bored because they can no longer exercise or play for long periods of time like in their good old days! The bad news is, stress and boredom are two main causes of acral lick dermatitis! So if your old dog has this problem, try to stimulate his mind with regular exercise and interactive games to see if that would ease the problem. Older dogs tend to have all sorts of lumps and bumps on their skin! The thing is, skin lumps and bumps can be benign or malignant but it is difficult to distinguish without any tests. If you find any lump or bump on your old dog, be sure to ask the vet to take a look. He may do a needle biopsy to see if it is just a small harmless growth or a cancerous tumor. What would you do if your old dog has skin irritations? Load up his system with steroids and antibiotics (thereby weakening his immunity further), or use a holistic approach and natural remedies to tackle the skin issue AND to strengthen his immune system? Yes, I would choose the holistic approach too! Below is an outline of what a holistic approach can look like. Also add whole foods that can support the immune system to the diet. Foods such as mushrooms (e.g. shiitake, maitake), broccoli, carrots, berries (e.g. blueberries, raspberries), probiotic yogurt are all excellent choices. Herbs that have immune-support functions can be used to further boost the dog’s immune system. Culinary herbs such as oregano, parsley, turmeric, ginger, thyme, and basil are good to add to the food. Also use specific herbal supplements to target the immune system. Herbs such as Echinacea, Astragalus, Cat’s Claw, Oregon Grape are all immune-boosting herbs to consider. It contains not only immune-support herbs such as astragalus and cat’s claw, but also other powerful extracts such as from mushrooms and green tea, as well as vitamin C and more. All of these substances work together to give a much-welcomed boost to an old dog’s immune system. We can use natural dog skin irritation remedies to soothe itching, dryness and discomfort. If your dog has itchy skin but shows no signs of redness or infections, you can try using oatmeal as a topical application to the itchy area(s). Simply cook some oatmeal into a soup-like consistency. Allow it to cool, and apply it to your dog (it’s a good idea to do this in the yard!). Allow the “oatmeal soup” to stay on the skin for, well, as long as your dog lets you. Then rinse it off with water. If your old dog has various patches of itchy, red, inflamed skin, use an herbal astringent. Astringents can tighten the skin, reduce inflammation and redness. Witch hazel is an effective astringent. I like this alcohol-free unscented Witch Hazel as it is more gentle on the skin (alcohol-free = sting free). Saturate a cotton ball with witch hazel and dab on the affected areas. Witch hazel hydrosol is an excellent and effective astringent. It is also antiseptic and antibacterial, so it’s perfect for dog skin irritations. Hydrosols are very mild and gentle on the skin, so no worries about irritating your old dog’s skin more! After using an astringent, to facilitate healing, try this amazing Itchy Owie Quick-Dry Gel for Dog Itchy Skin. It contains skin soothing aloe vera, vitamin E oil and evening primrose oil, as well as skin healing and anti-inflammatory herbs such as Calendula, Licorice, Oregon Grape, Yarrow, and more. It is an excellent skin healing gel for minor cuts, insect bites, infections, and itching. A must-have for your dog first-aid kit. If your dog has whole body skin irritations, consider a full body after-shampoo rinse. Apple cider vinegar is a simple yet effective rinse that can reduce dog skin irritations. Simply add 2 tablespoons of apple cider vinegar to 4 cups of water. Use it once a week as an after-shampoo rinse. There is no need to use water to rinse off the vinegar. Let the vinegar drip off the coat and then towel your dog dry. If your old dog has dandruff, massage undiluted apple cider vinegar into his fur before shampooing. An herbal skin rinse using skin soothing and antibacterial herbs also makes a good dog skin irritation remedy. Herbs that are skin soothing and nourishing include Lavender, Calendula, Chamomile, Rosemary and Peppermint. Use a combination of any of the fresh or dried herbs mentioned above. Pack them in a large tea bag (or several smaller ones) and steep in 4 cups of hot water until it cools. Add about 1 cup of apple cider vinegar to the herbal infusion. Mix well. Use it as an after-shampoo rinse. In addition to topical dog skin irritation remedies, supplements are also essential in helping dogs with skin issues. Vitamin C is essential for skin health. It protects the skin against sunlight, and plays an important role in the synthesis of collagen. It is a powerful antioxidant, and can help damaged cells die off instead of growing into mutated tumor cells. Although vitamin C can be found in healthy cells, old dogs have lower amounts of this vitamin in their cells. So it is a good idea to supplement your oldie with vitamin C, especially if he has skin issues. Omega-3 fatty acids are anti-inflammatory and anti-oxidative. There are lots of studies showing the benefits of Omega-3 FAs on skin health. When giving your dog Omega-3 FAs (such as salmon oil or krill oil), be sure to also given him vitamin E. Otherwise, the dog will run the risk of having vitamin E deficiency. Of course we all want to keep our dogs clean and smelling good, but we shouldn’t “over-clean” the dog. Too much shampooing can dry out the skin, causing skin irritation and itching. For dogs with sensitive skin or skin irritation issues, the choice of shampoo is important. Read this post to learn more about how to choose a good dog shampoo – what to look for, and what to avoid. Last, but not least, one of the most important dog skin irritation “remedies” is to look at some possible external irritants that may have caused the dog’s skin issues. If possible, eliminate such irritants from the dog’s environment. It’s easier said than done, I know, but try to identify things in our daily life that are possible culprits and see if they can be replaced. Some examples of irritants are chemical lawn pesticides, flea and tick preventives (e.g. spot-on, flea collars), artificial fragrance in the house, household chemical cleaning agents, etc. Dog skin irritation remedies involve taking a holistic approach and looking at the dog as a whole. Tackle the problem on the outside (eliminate environmental irritants, topical remedies to soothe and heal the skin), and at the same time, help the dog get better from the inside out (e.g. remedies for immune support, a health diet). If possible, do not rely on long-term use of strong medication such as steroids and antibiotics as they will only weaken the dog’s immunity further.